The Gobi Bear Photography Expedition a unique wildlife photography opportunity for adventurous wildlife photographers. Mongolia is the least densely populated country on earth … the place to go if you are looking for solitude, wide open spaces, sunny weather and a true wilderness experience. It abounds in rare wildlife,with the Gobi Desert boasting a surprising array of large animals including the snow leopard, argali, ibex,wolf and of course the extremely rare Gobi Bear. It is a landscape and wildlife photographers paradise. The Gobi Bear is the World’s rarest bear and one of the World most endangered species with scientific studies putting the numbers left at between 30 and 40. 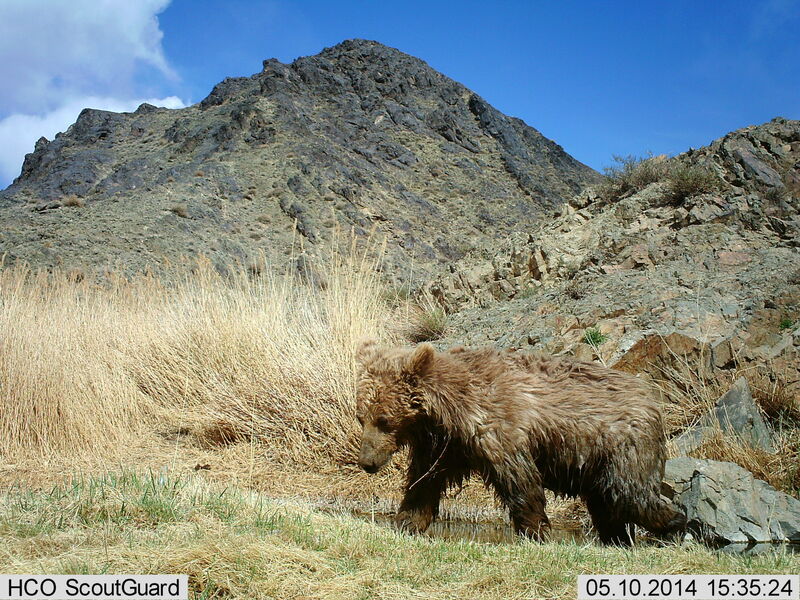 There is very little photography of the Gobi Bear and even less film. The area where the Gobi Bears are in southern Mongolia in the Gobi Strictly Protected Area and until now the only people allowed in to track the Gobi Bear have been scientific research expeditions and National Geographic to try and film the Gobi Bear. We have negotiated these unique permissions due to our extensive contacts in Mongolia and the future photography expeditions to this are will be used to boost the slim resources of the Gobi Bear Foundation. Breakfast and check-out. Depart for the Hustai National Park, the home of the wild Perwozski Horse Arrive in time for lunch. As well as being home to the rare Perwozski Horse, Hustai National Park is home to lynx, wolves, deer and marmots. While we will definitely see the horses, marmots and deer, sightings of wolves and lynx will involve a degree of good fortune, given our short time in the Park. Following lunch we will enjoy an afternoon drive and leisurely walk in search of wild horses and other wildlife. Early risers will have the opportunity of a very early game drive, followed by breakfast.After breakfast we will begin the drive to Bayanhongor. We will take frequent stops as we skirt theHangayn Nuruu mountains, arriving at our destination late in the evening. Lunch will be enjoyed along the way. Following an early breakfast we will continue our drive south into the Gobi Desert. Our destination is Elhin Gol,within the Gobi Strictly Protected Area, home to the Gobi Bear. Hear we will meet with the head of the Gobi Bearresearch project who will introduce us to this unique environment and brief us on its incredible natural history.As dinner is prepared we will take a relaxed drive into the surrounding mountains, enjoying its stunning vistas,beautiful aromas and, if we are fortunate, some of its wildlife. Following a very early rise, we will drive into the countryside in search of wildlife. Enjoying coffee onthe way, we will return to camp for breakfast. The rest of the day will be spent at the bear feeding station, where we will have the opportunity to set overnight camera traps. Wolves, snow leopards, argali, ibex and bears have all been photographed previously. As per day 5, visiting another spot within the bears range. As per day 6, visiting another spot within the bears range. Today we will take a short journey East into the Gurvain Saikhan National Park. We will spend a day in the Gurvantes area, home to the snow leopard research station where we will have the opportunity to seek out these most elusive of cats. Following an early breakfast we will cross the mighty Khongyron Els, the highest sand dunes in Asia (and thesecond highest in the World). After a lunch spent with nomadic camel herders we will continue to a secluded gorge to pitch camp. This gorge has been the scene of many wildlife sightings by our team over the years including snow leopard, Ibex and wolf. As we enjoy dinner we will watch a variety of vultures and raptors soaring overhead. To apply for one of these 8 available places on this recce please get in contact with us by email or phone and give us a brief background on yourself and your wildlife photography history and any expedition experience. Please give us any links to your online wildlife photography. 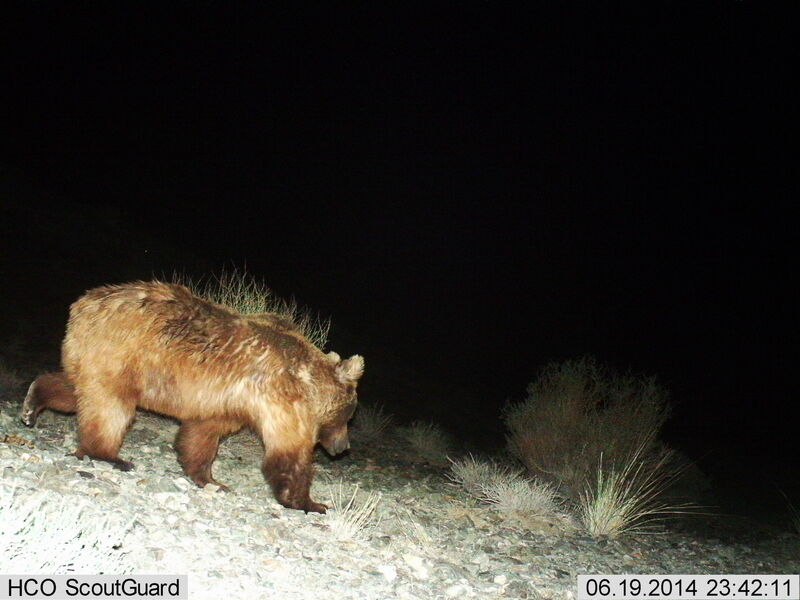 Also please state why you want to take part in the Gobi Bear photography expedition. Cost based on 8 paying photographer guests. Per person sharing: £2,000 this is 50% reduction on retail cost from 2016. Why is the recce discounted? Even with all our joint Mongolia experience we have never operated in the restricted areas before due to never being allowed in! Therefore we want to ensure we have all the challenges of wildlife photography of the Gobi Bear ironed out before we take full paying guests and some professional wildlife photographers who want the chance to get photography of this elusive and rare bear. Some bears have tracking collars and this means tracking them over rough terrain working with the local rangers and we want to see how this works with a small group of wildlife photographers. We want to give future photographers every opportunity possible to get photography of the Gobi Bear and that means ironing out the challenges a group of real live wildlife photographers presents and that is where you come in. Therefore you will need to be up for the challenges and willing to work as a team to achieve the expedition aim which is: To get high quality wildlife photography of the Gobi Bear. The Gobi Bear Photography Expedition is a unique opportunity for Wildlife Photographers to get the chance to photograph not only the Worlds rarest bear but one of the most endangered animals in the World and at the same time contribute to their future survival. This recce expedition at a 50% discount to future expeditions will allow ambitious amateur wildlife photographers who are used to operating in wild challenging environments a chance to photograph a rare animal which to date has not only been photographed very few times but has been only the domain of professional wildlife photographers.